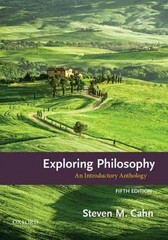 Exploring Philosophy 5 Edition Extensively revised and updated in its fifth edition, Exploring Philosophy: An Introductory Anthology is a uniquely accessible and engaging introduction to philosophy. Steven M. Cahn brings together exceptionally clear recent essays by noted philosophers and supplements them with influential historical sources. Most importantly, the articles have been carefully edited to make them understandable to every reader. The readings are enhanced by concise introductions, study questions, explanatory notes, and suggestions for further reading. While most other widely used introductory philosophy anthologies contain fewer than five articles authored by women, Exploring Philosophy, Fifth Edition, includes more than thirty, thus reflecting the major role of women in contemporary philosophy.